On Roosevelt Island yesterday, December 4th, 2017, two very different ribbon cutting ceremonies marked changes that will better our community and send waves of change around the world. We’re inspired by innovations impossibly large and delightfully small. After opening Nisi to a happy, waiting crowd, City Council Member Ben Kallos, State Assembly Member Rebecca Seawright and local media trooped south to Cornell Tech to join an international crowd gathered for what Seawright called a “momentous” announcement. In a packed room in what will no longer be known as “The Bridge,” Robert S. Harrison, Chairman of the Board of Trustees of Cornell, praised the generosity and transformative influence of a $50 million investment as well as Ratan N. Tata, Chairman Emeritus of the Tata Group, a Cornell alumnus. Tata, patriarch of the family that operated Tata internationally, was recognized by Harrison as a rare individual recognized as leader in both business and philanthropy. Cornell University President Martha E. Pollack and a group of speakers applauded the investment in Cornell Tech by Tata Consultancy Services, one the world’s most admired IT companies. 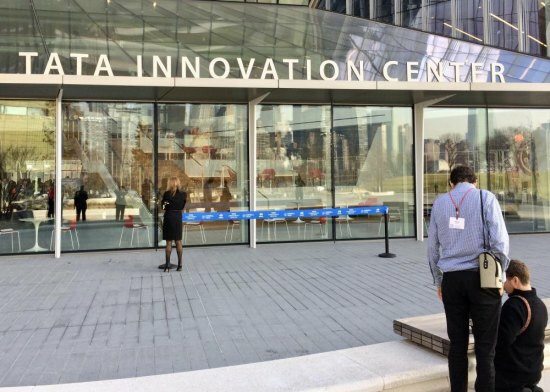 The Bridge, Cornell Tech’s original landmark building dedicated to merging technology research, commerce, government and social services will now be known as The Tata Innovation Center. The investment includes “a significant gift for the first phase of capital development on the Roosevelt Island campus,” seeding an endowment, as well as support for collaborating on technology research, which is at the core of Cornell Tech’s mission. Exciting news for New York and Roosevelt Island, “Cornell Tech will leverage TCS’ industry expertise and host its Ignite My Future in School program for educators across all five boroughs,” according to the Cornell Chronicle. It’s hard to overestimate what the Tata Innovation Center will bring to the world from its base on Roosevelt Island. “The Tata Innovation Center breaks down all barriers of innovation and collaboration, with a diverse group of tenants working alongside groundbreaking Cornell Tech academic teams,” said MaryAnne Gilmartin, President and CEO of Forest City New York, owner and developer of the building. That says a lot but maybe not enough. As speakers noted, in its short lifespan, Cornell Tech has made New York the technology center for the U.S. East Coast. Some will remember that the title “Silicon Island” was an early nickname for our hometown after Cornell and Technion won the contest to build Mayor Michael Bloomberg’s dream campus. 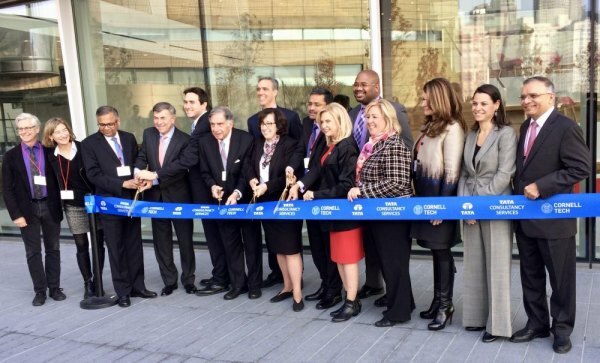 Leaders from Cornell, Tata Consulting Services, Forest City New York and elected officials gather for the official ribbon cutting. The nickname didn’t catch on, but developments have been true to that beacon. Never before has Roosevelt Island drawn the spotlight of so much international attention, attention that’s growing as the newly built campus goes picks up steam its first year. The future is limitless, and it begins right here on our own two mile long protrusion of Manhattan schist carved out by the East River and lightly soiled over. “The Tata Innovation Center will become a hub for New York’s tech sector and a global icon for how academia and industry can collaborate to leverage technology for the greater good,” said President Pollack. As national turmoil disturbs social and political networks, perhaps the most impressive thing about Cornell Tech, lead from Day One by Dean Dan Huttenlocher, is how gracefully it’s carried on its mission, unfazed and unflinching, to contribute mightily to a better world through the universal infusion of technology research. Nothing seems able to disconcert this juggernaut of worldwide betterment. This latest step forward gives us hope that she is absolutely right.